This necklace also takes advantage of the popularity of this season's long statement pendants. 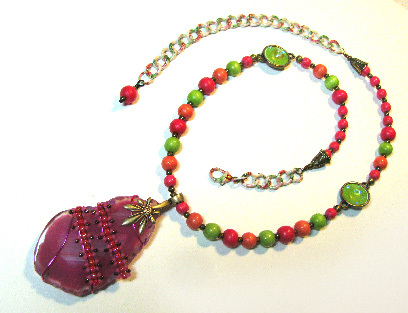 The project is easy to do, but it will use a lot of your jewelry-making skills. Part one is today, and next week will be part two. 20 gauge Zebra wire, magenta, 16"
18 gauge brown wire, 6"
1. 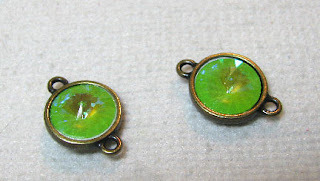 Use 2-part epoxy resin to glue the rivolis into the links. 2. Squeeze bail tight around the agate slice (not shown). 3. Cut 12" of beading wire. Using the alligator crimps to keep the wire from pulling through, string 4" of 8mm beads alternating with 3mm metal rounds on each side of the focal. String enough 3mm rounds in the center to allow the bail to swing freely. String both sides. 4. Use a crimp bead and a crimp cover to attach the wire to one side of the rivoli link. Repeat on the other side. Bury your wire through a few beads, tighten and clip the wire close. 5. Attach new wires to the top of each link using a crimp and crimp cover. Each of these wires should be about 8" long. 6. String about 2" more of the 8mm alternating with 3mm rounds, and then switch to a single color of 6mm beads alternating with 3mm rounds. String about 2" more of the smaller beads. Cut 2 pieces of 18 gauge brown wire and turn a double loop at the bottom of each. 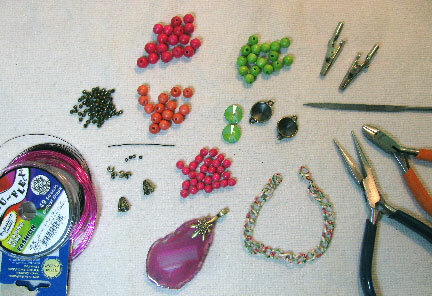 With the beading wire, go through a crimp, the turned loop, and back down through the crimp and several more beads. 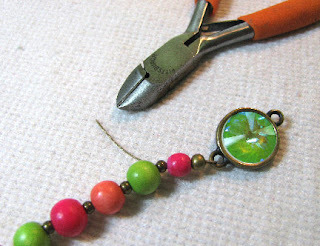 Tighten the beading wire, flatten the crimp, and clip off the end of the beading wire. Add a cone to the brown wire to hide the crimp. Repeat on the other side. 7. 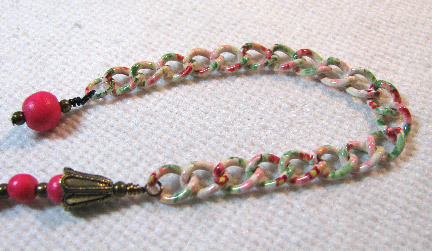 Snip one of the links in the decorative bracelet chain to remove the clasp along with 3 or 4 links. Using the wire on each end of the necklace, add a 3mm metal round and make a wrapped loop around the bracelet chain. 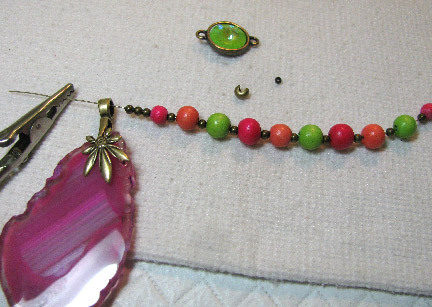 Do the same on the other end, adding the shorter piece of chain with the clasp (not shown). 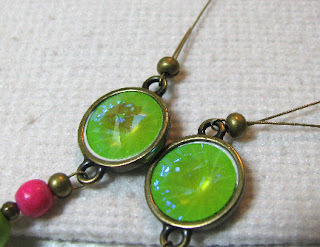 Use a head pin to create a dangle for the end of the long chain. Attach it with a wrapped loop. Next week, we'll fancy up the pendant a bit to make it more in keeping with this season's style!